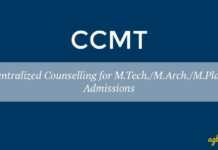 CCMT 2018 Seat Allotment – The allotment of seats in CCMT 2018 has been announced online. In it, seats are allocated to the candidates on the basis of GATE 2018 / 2017 score secured by them. The allotment will be done in the participating NITs and CFTIs. In all, there will be four round of CCMT Counselling 2018 (including the Spot Round) and the allotment will be done in all. 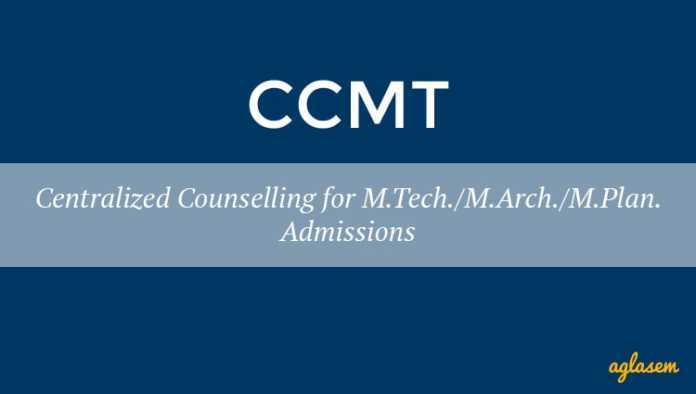 Check more details on CCMT 2018 Seat Allotment from here. Latest: CCMT 2018 2nd internal sliding result has been announced. Vacancy list of NSR has also been released. Candidates can check the same from the official website. Choices submitted by the candidate is processed and seats are allotted in the order of merit on the basis of the locked choices. The allotment result is available on the CCMT website: http://ccmt.nic.in. Individual allotment letters will not be sent to the candidates. Candidates will be required to take a printout of the allotment details from CCMT website which will be produced at the time of reporting. Click Here to check the CCMT 2018 2nd Internal Sliding Result. Click here for Provisional Admission Confirmation Fee. Candidates will first have to register by submitting personal and GATE details. Then, the candidates will be required to submit choice for the course and colleges, in order of priority. Next, the choice filling data will be reconciled by the conducting body and on the basis of GATE Score and submitted choices, the seats shall be allocated. The CCMT seat allotment data will be uploaded online and candidates will be able to check it from the CCMT 2018 Login. Candidates who will be allocated the seat will have the following options. Candidates will have to chosse one option, else the CCMT seat allotment 2018 shall be canceled. Freezing – This option should be chosen when the candidates are satisfied with the allotted seat and would like to accept the allotment. Floating – Candidates should choose the floating option when they are not satisfied with the allotment would like to participate in next round of counselling, for considering the higher choices in other institutes. Sliding – Choosing this option indicated that the candidate would like to consider higher choices in the same institute. Withdrawing – This is the option which should be chosen when the candidate is not satisfied with the allotment and wished to withdraw from the further counselling. After the allotment of seats, the candidates will have to visit any of the Reporting Centre and pay seat confirmation fee of Rs. 10000. The amount will be adjusted against the admission fee amount. At the center, candidates will also have to get the following documents verified. Only if the verification of the document is done successfully, the provisional allotment of seat will be converted into final one. Candidate should carry the following documents at the time of reporting at the RC. Printout of the Registration form and the locked choices. Original Certificate of category (SC/ST/OB), if applicable, as per Government of India, issued by the competent authority. Refer “http://ccmt.nic.in Formats for Certificates” for formats. In case of OB category, the certificate must be issued on or after April 1, 2018. Note: Caste certificate (SC/ST/OB) issued by Maharashtra State must be validated by Social Welfare department (in case of SC and OB category) and Tribal Welfare department (in case of ST category) of Maharashtra Government. The SC/ST/OB candidates of Maharashtra State have to produce their caste validity certificate in the exact format available on CCMT website (http://ccmt.nic.in). One set of self-attested photocopy of all the original documents. along with one set of self-attested photocopy. sir after 2 round seat allotment how i can further upgrade for floating…i means i have to go again that center or its self upgrated?